What happened Steve, you were supposed to be indestructible :(. Steve Irwin, the much beloved Crocodile Hunter and the main bloke behind animal conservation in Australia died today when he was stung fatally in the heart by a stingray. 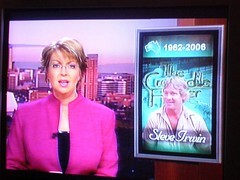 He was a real character and a real part of Australian culture. You will be missed Steve. Deputy Prime Minister Mark Vaile says Australians will be saddened and shocked by Crocodile Hunter Steve Irwin’s death in a marine accident. The 44-year-old was killed by a stingray barb which pierced his chest while he was shooting a documentary on the Great Barrier Reef. Mr Vaile, who presented Mr Irwin with an Australian export award in 2004 for his Australia Zoo, said the Queenslander had made an amazing contribution to conservation and business. “I was a tremendous fan of Steve Irwin because of his larger-than-life personality and his ability to highlight wildlife conservation in a way that people from all walks of life could identify with,” the Nationals leader said in a statement. “Steve Irwin’s operations included his zoo, television series, The Steve Irwin Conservation Foundation, and International Crocodile Rescue. Foreign Minister Alexander Downer, who used a photograph of his family at Australia Zoo for his official Christmas card last year, hailed Mr Irwin for his work in promoting Australia. Mr Irwin was heavily involved in this year’s “G’Day LA” campaign. “The minister knew him, was fond of him and was very, very appreciative of all the work he’d done to promote Australia overseas,” a spokesman said. Tourism Minister Fran Bailey said Mr Irwin was a great Australian icon who contributed enormously to the nation. “He was a larger-than-life character who was loved by millions of people worldwide,” Mrs Bailey said in a statement. “Americans adored him. Thousands visited Australia Zoo. Mrs Bailey said she had been honoured to present Mr Irwin with his award for services to the tourism industry at the Australian Tourism Awards last February. Opposition tourism spokesman Martin Ferguson said the whole tourism industry was in shock at the loss. 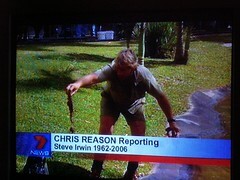 “Steve Irwin was a true Aussie icon and a fantastic ambassador for Australia,” Mr Ferguson said in a statement. He passed on Labor’s sincere condolences to the Irwin family.